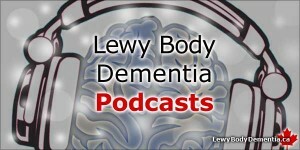 The Lewy Body Podcast Playlist: Listen At Your Convenience. Some people might prefer to have the articles and posts available to listen to as a “podcast” rather than a text document, so I am testing this by including several of them below. You can either listen to them here, or download them. And you can always read them as text on the main Tips Blog page as well, which will be the most up-to-date. The sound quality is not perfected, but if this feature is found to be useful by website visitors, I will significantly improve it, and add to it. Listen to the Lewy Body Podcast playlist below. The goal of this website is to provide the most important information to help your journey with Lewy Body Dementia the best it possibly can be. There is an additional focus to provide information for people who are new to the world of Dementia with Lewy Bodies, and Parkinson’s Disease Dementia. If you have any thoughts on the sound files, or suggestions for topics and posts — I welcome any you may have. I want to make sure the content of this site is as pertinent and high-priority as possible. I do not record every article as soon as it’s done, but wait until I have incorporated any suggestions or edits to make each piece the best it can be. The articles take a long time to research, write, and edit. The recording is only done when a piece has been effectively and comprehensively edited for clarity and utility. This means that you can usually read newer information as an article long before its recorded for this Lewy Body Dementia Podcast series. Hoping these provide useful information, and are in a format that is helpful to you! This 50-minute podcast by Dr. Boss — who coined the term “ambiguous loss” presents a compelling case.